Love MJ & Tiger? Save Those Box Tops! Upper Deck’s new World of Sports set hits store shelves today and is unlike anything ever seen before with its robust assortment of trading cards covering baseball, basketball, hockey, golf, soccer and more! It features the best players from a variety of sports and there are no two bigger stars on the planet than Michael Jordan and Tiger Woods. Up for grabs - To take home one of these highly sought after dual autograph cards of MJ and Tiger, you'll have to send in your box tops! 5. Winners will be announced on April 7, 2011, so don’t delay, get those box tops in today! Send in those box tops and take home a signed piece for history for two icons! Five lucky fans will take home these ultra-rare cards of these two legends from their respective sport. 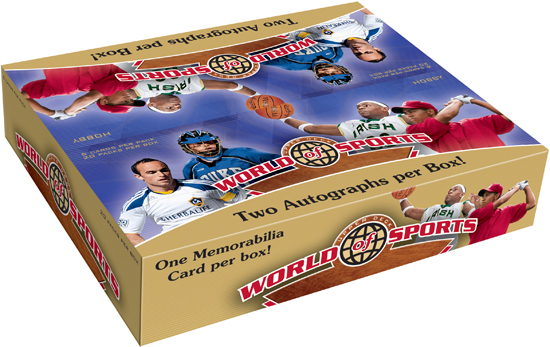 Collect Upper Deck’s 2011 World of Sports set and win! For more details on this promotion details, click here. Wow, awesome giveaway UD! Is there a limit to how many box tops we can send in one envelope or whatever? Wow! There you go Upper Deck! Your out doing yourself this time! 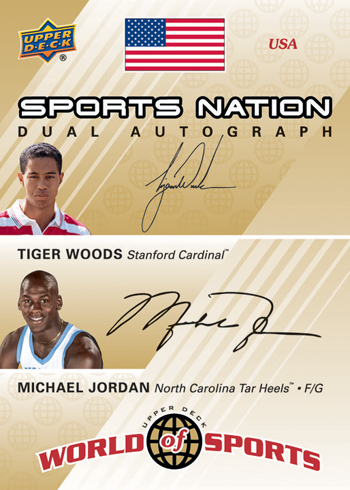 For a chance to get an MJ/Woods Dual Auto! Sweet! You know I’M IN! Wow ! A card that I’ve been waiting for! Will try.